Oklahoma City Sprinkler Installation — French Drains — Rain Freeze Sensors. and many other Drainage Problems. CMG Sprinklers and Drains – Servicing all of Central Oklahoma. We install: Sprinkler Systems — Drainage Systems — and provide Expert Sprinkler System Repair. Lawn Sprinkler Installation requires a great deal of expertise and experience. In Central Oklahoma, Sprinkler System Code will vary from city to city. Sprinkler System Code in Norman will be different from Yukon for example. CMG will make sure Sprinkler System Installation is done correctly. Drainage System are also a big part of our business. CMG utilizes: French Drains, Surface Drains, Channel Drains, Trench Drains, Gutter Down-Spout Connections, and Sump Pumps. 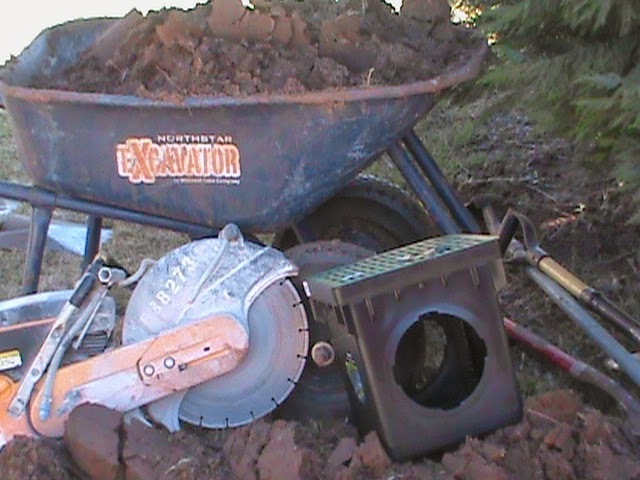 A Drainage System may require one or several of these elements to correctly address a Drainage Problem. Finally, we also provide expert Sprinkler Repair. If any aspect of your Sprinkler System is not working correctly, we can help. This includes: Sprinkler Controller, Valves, Sprinkler Heads, Pipes, Sprinkler Wiring, and Coverage. If you live in Edmond and need a French Drain installed by your driveway, or if you live in Oklahoma City and would like a Sprinkler System Installed, or if you live in Norman and have Broken Sprinkler Heads that need to be replaced, Give CMG a Call!!!!!!!!!!!! CMG Sprinklers and Drains can diagnose your Drainage Problem and design a Drainage System to fit your specific needs. We have been solving drainage problems since 1993. CMG utilizes: French Drains, Surface Drains, Channel Drains, Basin Drains, Trench Drains, Basement Drains, and Sump Pumps. We also specialize in Lawn Sprinkler Installation and Sprinkler System Repair. Adding a sprinkler system to your home is a great way to save time dragging hoses around. It also adds to the property value. Servicing Central Oklahoma including: Norman, Edmond, Oklahoma City, Midwest City, Del City, Yukon, Mustang, Moore, Purcell, and Blanchard. 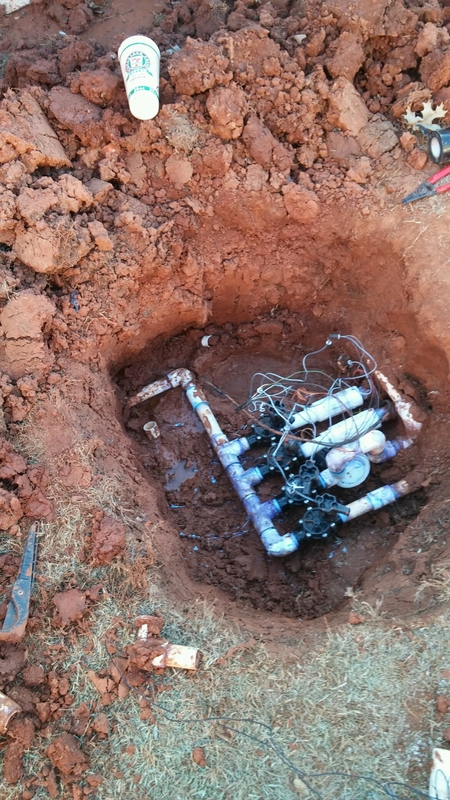 Oklahoma City Sprinkler Installation — French Drains — Rain/Freeze Sensors. 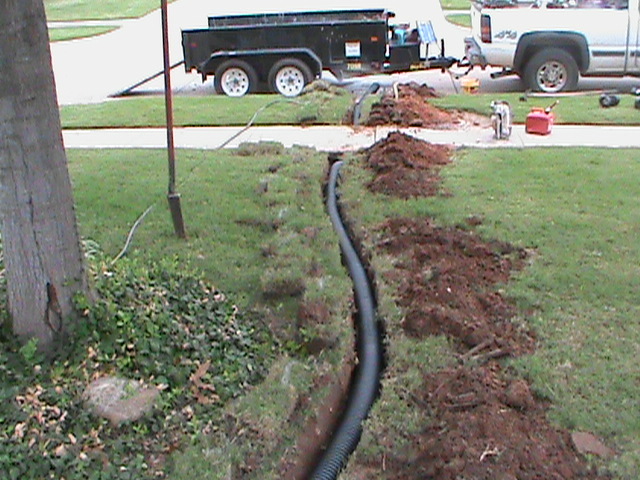 Oklahoma City French Drain Contractor — French Drains — Sprinkler Installation.